~ It isn't always about getting what you want. Sometimes it's about wanting what you've got. I’ve been making a quilt for my daughter, to mark the occasion of her moving into her own place. A kind of housewarming quilt, based on the log cabin pattern, which I believe was traditionally used for such quilts. It was also partly inspired by a quilt I saw in the book East Quilts West, by Kumiko Sudo. I’m pleased with the way the top came together, and the quilting, which I did freehand with the machine. And I must have got the basting pretty right too, since I got no wrinkles at all when I did the quilting. When I came to the binding though, a different story! I wanted to do a double fold bias binding, at least I think that’s what it’s called, and I went straight to the first tutorial I found – How to bind a quilt with mitred corners and invisible joins, by MadebyMarzipan. It looked straightforward, so off I went. 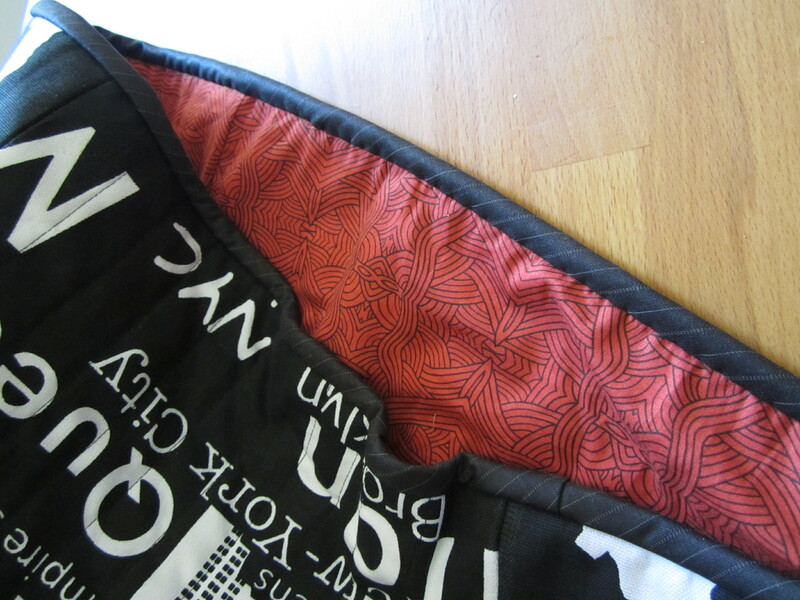 I cut the binding, joined the strips, pressed, and stitched all around the edges of the quilt, all eight metres of it. Then I sat down to hand stitch the folded edge in place. I was still going well until I reached the first corner. It’s a disaster. I’m not sure why, but mine doesn’t look anything like the video. The only explanation I can think of is that I chose to make a wider border, about one inch wide finished, whereas the video shows a much narrower binding. I didn’t think it would make a difference, but apparently it does. So, my corners look more like the ends of rugby balls than neatly mitred corners. As usual, I was trying to get the quilt finished at the last minute, and no way was I going to unpick all eight metres of binding to try a different way, so the corners have stayed like rugby balls. Next time, if I ever make another quilt, I will try the binding out on a practice piece first, to make sure that the corners will work. I might even have a go with strips of paper, since I’m sure it’s got to be a principle of geometry that has let me down. But I find it really hard to envisage without actually doing it. Other than the corners, the quilt was a success, and well received. I was so last minute in finishing it that I haven’t yet taken any pictures, but when I do, I sure won’t be including the corners! Another thing which I did photograph, because it came out pretty well, was a Thermomix cover I made, again for the same daughter. 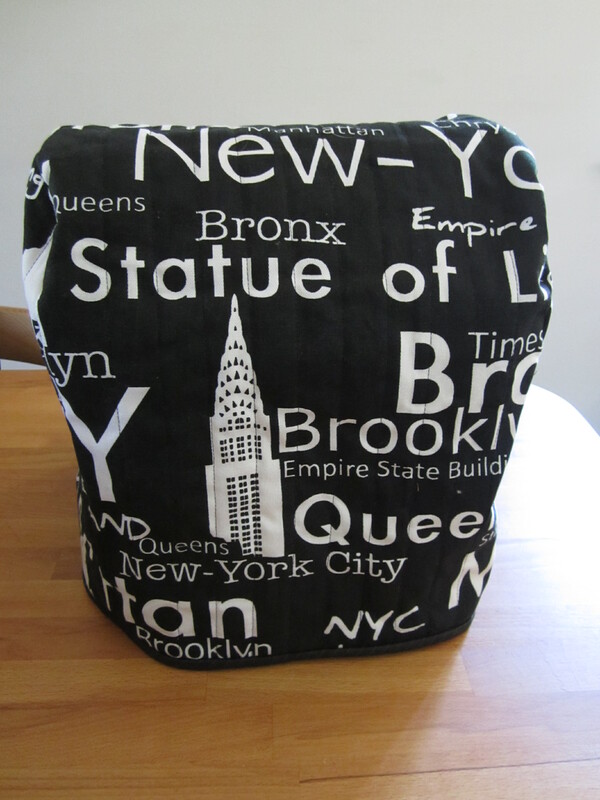 I had found some fabric which goes with her monochrome apartment, and also her love of travel, so here it is. Interior, I went with a splash of colour here. I used a pattern I bought online, from The Pattern Emporium. I’m pretty pleased with it, but a Thermomix is obviously bigger than I thought. The pattern says that it will fit an average overlocker as well, so perhaps when I get my sewing space organised I’ll make matching covers for my machine and overlocker. It also has useful pockets on the sides for accessories etc., which is another idea worth pursuing. On starting a New Year, what I intend to do with this one! As is often the case, I was struggling for a topic to write about. Don’t get me wrong, I have lots of ideas in my head, but discard most of them, usually because I think they will be uninteresting to anybody but me. Today I turned to other sewing blogs for inspiration, and landed on Hand Made by Carolyn. 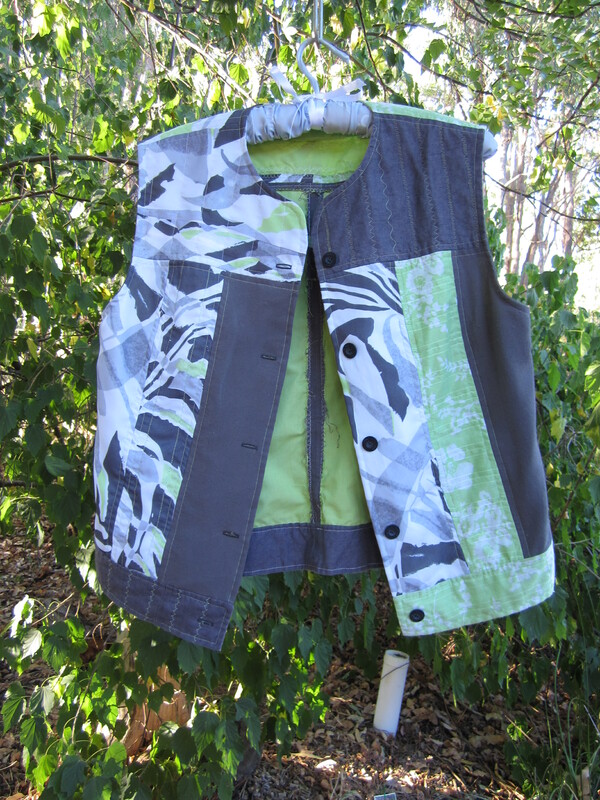 I have read Carolyn’s blog quite often in the past, and been stunned by the clothes she makes, not least by how she finds time to do so much sewing. I have great admiration for a fellow West Australian. Her most recent post was what got me thinking. She wrote about ‘thoughtful sewing’, using less, using locally sourced materials, and taking time to make fewer more labour intensive garments. So, I have decided that this year I am going to concentrate on using up some of the stuff I already have. Like most sewists, I have a fairly comprehensive stash of fabric. I had planned last year to re-vamp my sewing space, and get some organisation into the storage, but so far that hasn’t really happened, at least not as much as I would have liked. I have started to go through the stash, with the result that I now know where most things are, but I haven’t started on the workspace yet. That always seems to get put off until I have finished my current project, but I am determined that once I have finished this current project (a quilt for a recently moved out of home daughter), the workspace comes next. The sewing is bound to continue though, and I will really focus on using up the stuff I have. Fabric, patterns, notions. I have patterns I have never sewn (some with good reason – those 80’s dresses, what was I thinking!). Probably unlike most sewists though, although my stash contains a good number of uncut, garment size pieces, it also contains a lot of scraps. When I cut out a garment, I don’t throw away the odd-shaped bits that are left over. I gather them up, wrap them in whatever large bit of fabric is left over at the end of the piece, and stash them. I’ve been doing this for well over 30 years, so there are a lot of left over bits, varying in size from quite large to hardly useable. One point in my favour is that I am rather keen on clothes made out of more than one fabric. I like contrasting trim, or toning trim, and garments made out of updated patchwork. 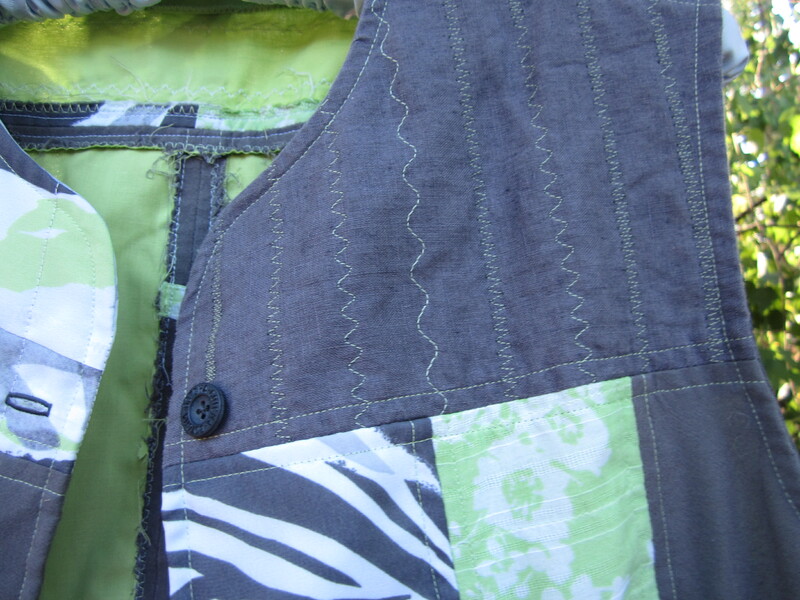 I’ve made a couple of things in this vein in the past, a vest made out of about 6 different black fabrics, another made out of various scraps in lime green, white and grey. There are a couple of things I’m not happy with here. First is the fact that when I made this I couldn’t get the overlocker to work properly, so in the interests of getting it finished I just overcast all the inside seams with a zig zag. It looks fine when I’m wearing it, but not so good for a photo shoot! 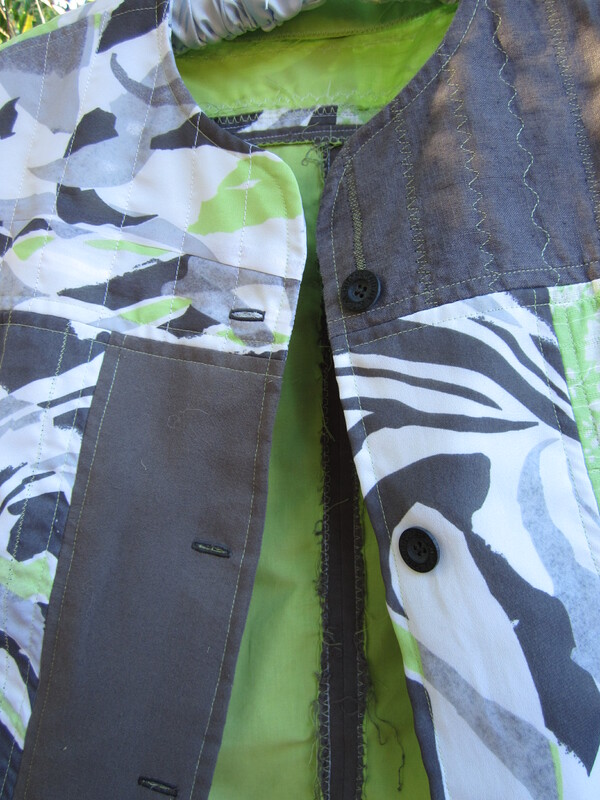 I thought I would just do up the buttons to conceal most of the inside, but then I found that I couldn’t. I used quite large buttons, and because I hate the look of really large buttonholes, I made these smaller, so the buttons don’t actually go through them. Again, not a problem when I’m wearing it, since I would never wear it buttoned up. Here are some closer up shots. In order to blend the plain grey a bit with the other fabrics I did some machine embroidery – at the time I had just bought my new Bernina and was trying out some of the stitches. Now is the time to really focus on this sort of garment sewing, and see if I can make a dent of some sort in the pile of scraps which is my stash. Obviously there are going to be some things made out of the uncut lengths (which of course will give rise to more scraps!). And I’m not entirely ruling out buying the occasional piece of new fabric, but I am going to try hard not to. This is also going to give me ready made subjects for blogging, since I will try about once a month to write about what I have been doing for this self administered challenge. I’ve been having a major sort out of some stuff which has been kicking around for years, decades in some cases. This is a precursor to redoing my sewing space. One of the things I came across, and which has been around for decades, is a piece of cross stitch. It is finished, and I have thoughtfully dated it 1994! It’s still not framed! 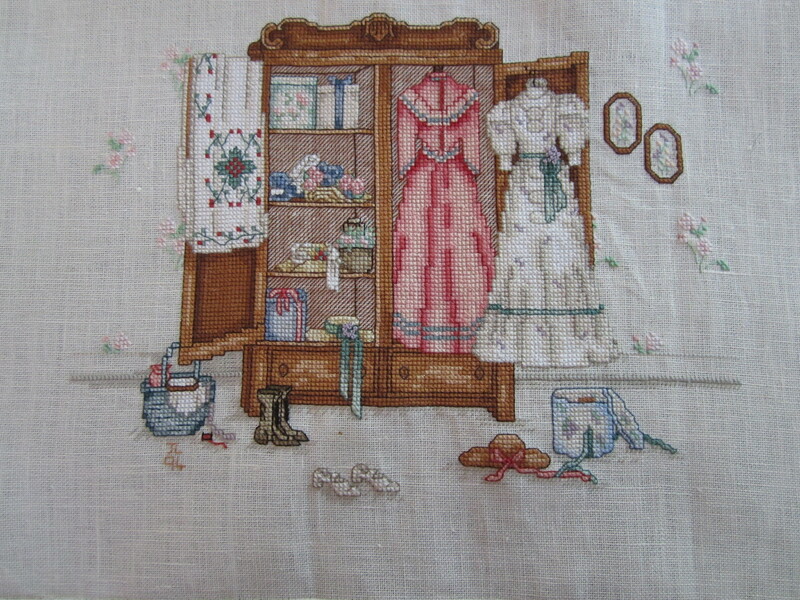 ‘A Cameo of the Past’ cross stitch design by Paula Vaughan, circa 1990. At some point I have obviously flouted the golden rule of embroidery, and left my needle in the work, maybe for some years, who knows! 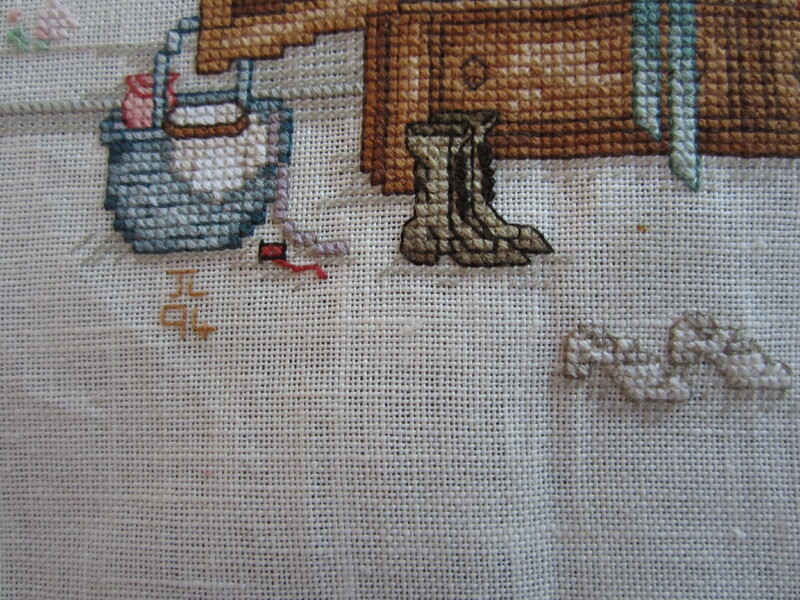 There is a tiny rust speck, just to the right of the boots, which hasn’t come out, even though I have washed the piece. There may be a way of getting it out, but I’m not too bothered. I’m not against the odd imperfection, it gives character, don’t you think?! So I have put it on the table in the sewing room in order to motivate myself to get it framed. The framing I will get done professionally, but I thought I would stretch and mount it myself first. A session on Google turned up what seems like a sensible, relatively easy and yet professional way to do it. It involves getting a piece of foam core board, cutting out a rectangle a bit bigger than the embroidery, and mounting the cross stitch on it with pins put into the sides of the foam core. I haven’t explained that very well, I will take some photos as I work and try to illustrate it a bit better. I found a few descriptions of how to do it, a good one is here at Wildfaces Gallery. I have bought the board, but I didn’t have any of the short pins, which are variously called either sequin pins or applique pins. My local fabric shop didn’t have any either, so I ordered them online, but that was before Christmas, and they haven’t arrived yet – probably because it has been Christmas. Once they arrive I will be able to get started. Out of curiosity I went looking for the pattern for the cross stitch. And I found it , on sale on Etsy. OK, so it’s a bit kitsch, but not nearly so bad as some other cross stitch patterns of the same era. I do remember that when I had finished it I had a lot of thread left over (there are lots of colours in the pattern, and it only uses a very small bit of some of them). Because of that I bought another similar pattern, thinking to use up the thread, but I have probably used quite a lot of it in other things over the years. I don’t remember what the other pattern was called, it was another of Paula Vaughan’s, but there are several that look familiar and I’m not sure which it was. Perhaps one day it too will come to light and I’ll start another cross stitch – it may also take 20 years to be finished and framed!